Modern houses are smaller and designed to be more airtight to protect against increasing air pollutants, providing the perfect environment for health issues. Outside often fares little better, thanks to subdivisions, smaller housing lots, subsequent diminishing garden space and the popularity of artificial lawns also impacting on the quality of our atmosphere. The resultant poorer air quality in buildings and its negative effects is known as ‘sick building syndrome’. Think about the toxic gasses emitted around us daily from air-conditioners, unflued gas heaters and gas cooking appliances, not to mention paints, carpets, upholstery, insulation, photocopiers, cleaning agents and a number of other everyday products… and that’s just inside the building. Constant exposure can cause serious health issues, especially for those who suffer from respiratory ailments, such as asthma. Studies by the University of Technology in Sydney NSW have found that in a room of approx. 10-12 sqm, just 3 large plants or 6 table sized plants can eliminate between 50-70% of these toxic gasses. The plants they used were Dracaena Deremensis and Peace Lillies but they found that kentia palms, devils ivy and umbrella trees also worked, and they believe most other plants will do likewise. 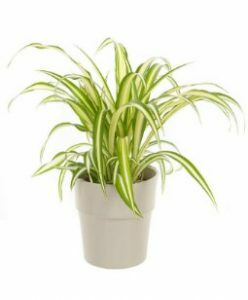 NASA (USA) found that spider plants can remove more than 90% of carbon monoxide and nitrogen dioxide from our living and working spaces. Their study found that plants not only convert carbon dioxide into oxygen through photosynthesis, many also remove dangerous elements from the air such as formaldehyde, benzene and trichloroethylene. Some of the plants they used for their 2-year study and which they found most effective included heartleaf and elephant ear philodendron, English ivy, spider plant, weeping fig, peace lilies, Chinese evergreen, snake plant and bamboo palm. An urban heat island is an area that is noticeably warmer than its surrounding rural areas due to increased human activity, modification of land surfaces such as replacing grassed areas with pavers, and the increasing use of dark building colours, e.g. dark grey walls and roofs. As an area grows in population, its average temperature also increases. The urban heat island effect also contributes towards a decrease in air and water quality. Concern has been raised that the urban heat island effect may possibly be contributing to our planet’s global warming. Research in China found that the urban heat island effect contributes to climate warming by approx. 30%. To combat urban heat islands, more and more cities are encouraging the use of green roofs (rooftop gardens) and the use of lighter coloured surface materials which reflect sunlight and absorb less heat. In new suburbs of darker coloured houses built close together with minimal greenery you can imagine how easily urban heat islands can develop. Atlantis Vertical Gardens make it possible to surround yourself with greenery even with lack of space because you can attach them to fence lines as well as house walls. Instead of a solitary plant standing in the corner, or on a table, imagine a wall of green flourishing inside your home. Quite apart from the visually pleasing aspect and the fact that you’re helping to clean the air your family breathes, this green wall offers remarkable insulating qualities. It will help keep that wall and part of the house cooler in summer, and warmer in winter. This will also produce savings on your power bills, depending on the size of your ‘green wall’. You may need professional advice to choose the right plants depending on which room you plan to place your green wall because the amount of natural light and humidity it will receive will all factor into its effectiveness and will influence the types of plants you can grow successfully. Researchers have now confirmed that the presence of plants has positive psychological benefits in the workplace and for students. Their studies showed a reduction in stress levels and an increase in performance. 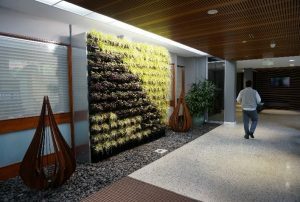 In parts of the world where SAD (Seasonal Affective Disorder) is a problem, researchers have found that a ‘living plant’ wall increases feelings of well-being and happiness. Sufferers of SAD experience feelings of depression, tiredness and lack of energy every winter. It is for good reason that people are advised to take a walk in nature when feeling stressed, so imagine if all you had to do was go home and enjoy your green wall to unwind and cheer up after a hard day. Taking this a step further, The Department of Plant, Soil and General Agriculture at Southern Illinois University in the US, did a study to investigate the effects of indoor horticultural activity on the well-being of the elderly inhabitants at two long-term care facilities. At the end of the study, they found that those in the horticultural activity group rated significantly higher on the wellbeing and happiness scale than the control group who did not participate in these activities. The elderly appreciate vertical gardens also because the gardens can be placed at heights which mean they don’t have to kneel or bend down. We are all concerned with the number of chemicals sprayed on our foods and genetically modified foods, and while we may not be able to safeguard every single thing we put in our mouths, we can take some control when we grow our own. Most people know vertical gardens are the perfect remedy for lack of external garden space, but how many have considered inside gardening? Or plants other than ferns or succulents? In fact, how many have considered vertical farming? Whether you want to grow your own herbs alongside your favourite flowering plants, you can do this inside as well as outside, provided you choose the right location. Overseas, homeowners are growing their own herbs and vegetables year-round on balconies and indoors with the aid of specialised lighting. Imagine, that unused wall could now become a healthy, living pantry. Some of the best plants to grow for this purpose include strawberries, lettuces, mint, chives, parsley, nasturtiums, sweet potato, Goji berries, small peppers and chillies, cherry tomatoes and baby varieties of carrots, beets, turnips and radishes. 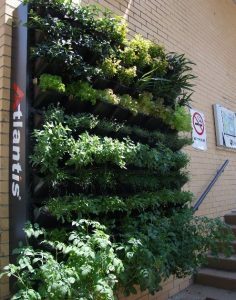 An Atlantis Vertical Garden solves many different problems on many different levels. For more information visit our sister site www.urbandirectwholesale.com.au.